Come learn to serve your community as an Ambassador for Climate Justice. At this free day-long workshop 50 students (age 8-14) will learn to make a difference for the world as part of Plant For The Planet, an international group of 34,000+ young people worldwide who are planting trees and leading communities to solve the climate crisis now. The day culminates in an educational and moving slideshow presentation for families and the public as the world’s newest Ambassadors for Climate Justice share what they have learned from each other and make their commitments to plant and speak for the trees! Felix Finkbeiner, recently named Reader’s Digest’s “European of the Year” tells his story best. Now serving as Official Tree-Counters for the United Nations Tree campaign, Plant-For-The-Planet is organized by children around the world who work for a better future on earth. They have a wildly ambitious plan that will change climate change for good in their lifetime. Since 2013 we have held over 12 Academies in Washington and Oregon. At the Academies new students learn from past students and wow, is it Fun! Children get to learn important facts about the causes and effects of the climate crisis and what children are doing to solve it as Climate Justice Ambassadors, members of a global children’s network, who make a real difference by planting trees, talking to leaders, conserving energy and inspiring people to care and to act now for their future. During the Academy children learn proper planting and more. They practice how to deliver a climate slideshow originally made by Felix years ago, and how to organize events to engage other children and adults in climate justice. Ambassadors get a free Plant-for-the-Planet T-shirt and the book “Tree by Tree” so they can learn more about how we plant now to shape our future. Having completed the workshop, Ambassadors pledge to take one action per month, whether it’s planting, giving a talk at school, writing a persuasive letter to a decision-maker, or attending a monthly meeting where students inspire one another to come up with more creative actions to make a real difference, like lemonade stands for trees, writing songs, or giving lawmakers “climate fortune cookies”. 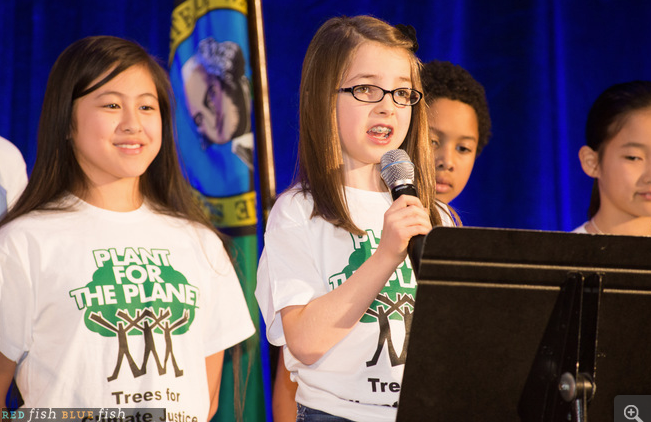 Local Ambassadors have been featured in HBO “Saving My Tomorrow”, introduced Governor Inslee, spoken out against dangerous oil and coal trains, counted over 10,000 trees planted, launched Washington’s Billion Tree Challenge, and trained almost 300 fellow Ambassadors. You may offer a donation if you like, to help cover costs or plant more trees, but volunteers and students help run the show so that participation at Plant-For-The-Planet and the Academy is always free for all children. 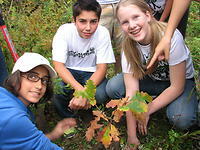 Thank you to the Parks and Forest stewards, for planting expertise and places to plant trees. Thank you to the kids, community partners, and all you wonderful volunteers for snacks, supplies and encouragement for our Ambassadors! If you are too old to be an Ambassador anymore, you can volunteer to help us guide 50 students as we explore this fascinating and important material. If you would like to enroll as a student or offer help — organizing, leading, donating supplies or snacks — please contact me for more info. To plant 1,000,000,000 trees in Washington State, we need everybody! Hey am one of the climate ambbassadors in kenya and I would want to know whether I could participate in any upcoming workshop in Nairobi.coz they are very fun and educative. We are facing severe draught in Maharashtra state,India.In this rainy season we want to plant plentiful trees.Can we get help from your organisation?